Jack is a veteran who was exposed to Agent Orange during his time in Vietnam. This exposure lead to neuropathy of the nerves which means in Jack’s case that he doesn’t feel pain when something is wrong he just feels tired and worn out. The Neuropathy also affects his ability to stand without support and Jack has had to use a cane for balance for a number of years now. 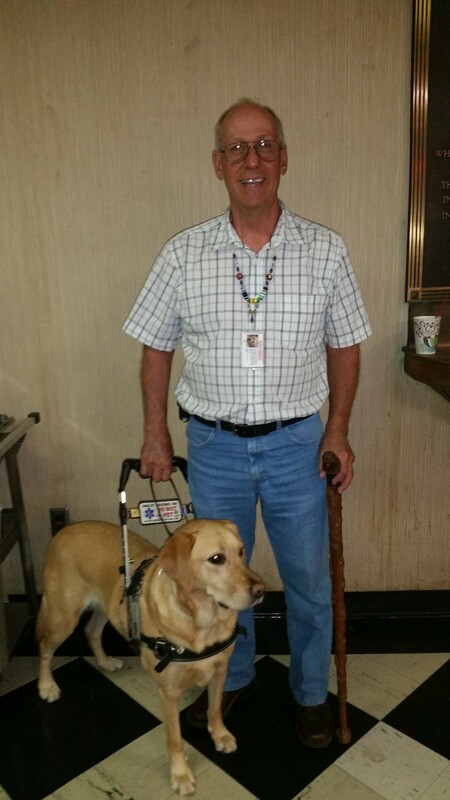 Thankfully God has provided Jack with a service dog named Bliss. Bliss is a brace dog who helps him balance. This dog has been a great blessing for Jack; not only can he be more active with Bliss at his side, but he has practically eliminated his need to use a scooter to get around. With Bliss helping him he’s been more mobile than he’s been for years. and twice now she has alerted and forced Jack to take steps that have saved his life! But this isn’t a testimony about Bliss and what she has done, but I would be remiss if I left her out of the story since her actions are the start of Jack’s testimony. Without her Jack wouldn’t have been here to tell us the rest of the testimony about his condition and the miracle that God wrought in his life. On November the 13th of last year Jack was sick… But he didn’t know it. All he knew was that he was feeling tired. Because of the neuropathy he wasn’t feeling any pain, but he was feeling extremely tired. Even though he has dealt with this condition for years he still has difficulties differentiating between when he’s tired, and when something is wrong. On this particular day something was wrong and Bliss knew it! She kept alerting and pressing her nose into his chest. Finally Jack realized that something wasn’t right and he went to the Doctor. While he was being seen Bliss wouldn’t leave him alone; jumping up into his lap and sticking her nose into his chest or his side. It wasn’t until the nurse who was taking his vitals looked at Bliss and said, “It’s ok. we know he’s sick. We’re going to take care of him” that Bliss finally settled down and stopped alerting. Jack wound up seeing the on duty Cardiologist who told him needed to have heart surgery to remove a blockage. They rushed him into surgery to place a stint and it wasn’t until after the surgery was completed that the Cardiologist realized that the results of the ultrasound that he’d used to make the decision to repair the blockage weren’t Jack’s most recent ultrasound report. The most recent ultrasound report showed that Jack didn’t just have a blockage of some of the blood vessels of his heart, but that he had a bad valve. The surgeon was extremely apologetic as he explained that if he’d known about the valve he would have fixed the valve first and then repaired the blockage. Unfortunately, because he was unaware of the bad valve the surgeon had only repaired the blockage. When Jack asked about when they would be able to fix the valve the Doctor started crying because he felt that he’d made the wrong surgical choice. He kept apologizing to Jack since they would have to wait six to eight months before another surgical attempt could be made due to the medication that Jack was on following the blockage removal. The Doctor told Jack that the only thing left for Jack to do was to pray, because the only thing that would save him would be a miracle since the valve wouldn’t last for six months. Jack went home knowing that the valve might completely fail anywhere between 2days to 6 months. The next day he received a call from the Cardiologist who had done his surgery. The Cardiologist had contacted another Cardiac specialist who was currently on vacation in India and talked to him for over 4 hours. The Cardiac specialist decided to shorten his vacation and came back from India the next Monday so he could see Jack. They had hoped that they would be able to put him on different medications but the Cardiac specialist said that they couldn’t change the medication for at least 4 months. To add insult to injury his doctor told him not to play his trumpet or do any exercise until his body had healed enough for them to attempt to put in a new valve. Jack reached out to Christians that he knew asking them to put him on their church’s prayer lists. People from all over the world began praying for him. He had phone calls from people he hadn’t talked to in years from Alaska and from Hawaii telling him that they’d found out that He was on their church’s prayer list and that they were calling to tell him that they were praying for him. Eventually a Cardiac surgeon was found who would attempt the surgery and Jack received a letter from the VA telling him when and where to show up. The day he was supposed to be admitted to the hospital he went in, but no one knew that he was supposed to be there. At this point Jack was doing extremely poorly. He was exhausted and wasn’t thinking clearly. He was so despondent that he told the clerk to go find the Doctor and tell him that he was going to go jump in front of the first semi that he could find. The clerk finally made a call and Jack was quickly surrounded by the Surgeon, SW and the head nurse who came out to take care of him. What Jack didn’t know at that point was that the bad valve was failing and his blood was short cycling through his body. Essentially he had no energy left and they had to put him in a wheelchair so that they could start to take the pre-surgical procedures that they needed to do before the surgery the next day. Late in the afternoon on Tuesday they sent him to a local hotel to sleep for the night before the surgery. That night he took the medications needed for the surgery and started to hallucinate. He began praying to get the devil out of his head and read through a prayer book that he had been given. The more he read and prayed the further away those evil thoughts became and they eventually left his mind. On the next day Jack went in to the surgery early at 4 o’clock (an hour early) because he was so eager. The surgical staff prepped him and the next thing Jack remembered was waking up in the recovery room. The first thing that the nurse told him was that he still had a breathing tube in place and that he shouldn’t worry about it and to leave alone until they could remove it. Once the breathing tube was removed they left Jack alone and he felt so good that he sat up in bed and draped his legs off of the bed. When the Surgeon came in to talk to Jack he literally took a step back eyes widened in surprise. The Doctor told him that he had never had a patient sit up in recovery after this type of surgery and then went on to tell him that it was a miracle that he was even alive. He explained that when he had taken Jack’s heart out the valve was completely shot and he didn’t know how Jack had even been able to stay alive to make it to the surgery. He told him that during the surgery after seeing the valve he had looked up at the surgical team and told them that he couldn’t fix this heart; that it was too badly damaged. Then he started to cry. While he was crying he felt someone grab his hands and start moving his hands. For six hours he stood and watched while someone else controlled his hands and fixed Jack’s heart. For those people who don’t think that God is still in the miracle business I present Jack’s testimony. God used Bliss to let Jack know that there was a problem. He used people’s prayers to keep Him alive when the Doctors expected him to die, and he used a surgeon’s hands to make an impossible repair. This entry was posted in On The Road and tagged answers prayer, dogs, healing, heart failure, miracles, surgery. Bookmark the permalink.